As previously mentioned, life in and around the pond is governed by the changes in the seasons. For this reason certain measures are called for to care for your pond in each specific season. In early spring the increasing temperature of the air and water waken the pond from its winter slumber. The fish, in particular, need extra attention as temperatures rise. Warmer temperatures also bring an increased growth in the bacteria, which cause illnesses, and fish therefore need extra energy reserves to resist disease. JBL PondEnergil is a feed, which is specifically suited to meet these nutritional requirements. With a high energy content accompanied by a reduced protein content, it is easily digested. The fish are provided with a vital source of energy without polluting the water with unnecessary waste byproducts such as ammonium and nitrite from the digestion of the proteins. At this time of year the microorganisms which break down these pollutants are still largely inactive. More details on feeding fish are to be found in the following chapter. This is also the time to fortify your fish with JBL AccliPond. The vital ingredients in AccliPond promote the resistance of the fish to disease which is particularly important in spring as the temperature of the water slowly increases. A normal dose of, JBL AccliPond should be added to the pond once a week for 4 weeks. The danger of excess algae growth is especially high in spring as temperatures rise and the length of daylight increases. Specific measures can be taken to eliminate algae problems at the outset and substantially prolong the pleasure your pond brings. Pond water often becomes polluted during the winter, so this is the time to change about 1/3 of the water in the pond. At the same time any remaining fallen autumn leaves should be fished out of the pond using a net. Refill the pond with tap water. The addition of JBL Aqualon ensures that the quality of the water is suitable for your fish. Woody plant stems from the dormant winter period may be cut back now. New plants may be added from April onwards. If you do not wish to place the plants in existing plant areas, but in planting baskets, or if you want to establish new planting areas, do not use normal garden soil. Special earth for pond plants, available from specialist suppliers, is ideally suited for use in ponds, as its low-nutrient composition does not introduce excess nutrients, which would encourage the growth of algae. JBL�s planting baskets made from natural coir are the ideal containers for plants, blending harmoniously into the pond. The best time to thin out the plants is late summer. In the growing season, which is now beginning; the plants use up nutrients, which might otherwise encourage the growth of undesirable algae. The ideal way to support the biological ability of your pond to maintain a healthy balanced environment is by adding the recommended dose of JBL Bactolon for 4 - 6 weeks. JBL Bactolon introduces beneficial microorganisms to the pond, which break down pollutants and rotting matter and thereby ensure clear, healthy pond water. Early in spring, when the danger of frosts has passed, ice-free devices may be removed from the pond and stored for the summer. This is also the correct time to re-install the pond filter, if it was removed and stored over the winter. If you do not have a pond filter, now is the time to think about purchasing one. JBL has 3 different pond filters, which can be installed as pond-side models in an easily accessible position at the side of the pond. More information on the models is given in Chapter 6. The combination of pond filter and UV-C algae clarifier has many advantages. These devices work on the physical principle of UV-C rays which eliminate floating algae and algae spores and reduce the level of bacteria causing diseases. This successfully eliminates or prevents excess algae and produces crystal-clear pond water. A reduction in the level of germs promotes the health of the fish. The water is not polluted by chemical additives, such as algae preparations. When the temperature rises to about 150C towards the end of spring, your fish require a varied and nutritious feed with a balanced mixture of building blocks (proteins), energy carriers (carbohydrates and fats) and ballast material (vegetable fibres etc.). Now is the time to change the fishes� feed, from JBL PondEnergil to the wide range of JBL pond feed. 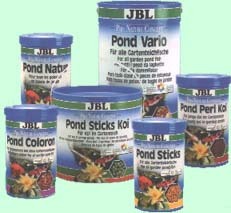 The JBL feeds, JBL PondVario, PondSticks, PondNatur, PondColoron, PondPerls Koi and PondSticks Koi, provide your fish with a high-quality, varied range. More details on feeding are contained in the following chapter. Summer is the time to enjoy your pond and appreciate its beauty, without the trouble of time-consuming tasks. 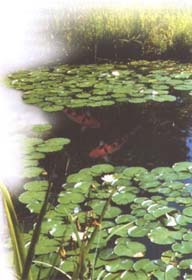 It may be necessary to thin out the plants to prevent the pond becoming overgrown. Regular monitoring of the water quality should also be a routine task. More details are to be found in the chapter �The correct pond water�. The water level may also need topping up during long periods of dry weather. The added water should also be given a helping hand with JBL Aqualon. As the water temperatures rise, the ability of water to absorb oxygen reduces. Therefore it is particularly important in summer that the pond filter or aerator work efficiently to supply sufficient oxygen. The pond filter or other aerating devices (e.g. JBL PondOxi pond aerating set) should be regularly checked to ensure that they are operating correctly. If necessary, clean the pre-filter mat of the JBL Pond Filter. The bioblocks, which are colonised by the beneficial cleansing bacteria, should be gently rinsed with pond water once each season. When the water temperature drops below 150C in autumn, the pond fish need easily digestible, high-energy feed to enable them to build up sufficient reserves for the winter. As in spring, the fish should now be fed with JBL PondEnergil. As the water temperature drops further, the amount of feed required by the fish will also decrease. JBL AccliPond further boosts the health of your fish, promoting their resistance to disease and fortifying them for the rigours of winter. 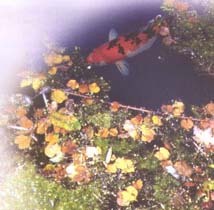 The pond needs more intensive care in autumn to help the fish and other inhabitants of the pond survive the winter unharmed. This is the best time to clean the pond thoroughly. Remove excess plant growth and some of the sludge which has formed on the floor of the pond. Carry out a partial change of water at the same time. Water taken from the pond may be used to water the garden. Refill the pond with fresh water, adding JBLAquaIon to improve the water quality to the benefit of your fish. Before the leaves start to fall in autumn, we recommend you protect your pond from dead leaves with a JBL Leaf Protection Net. The leaves would unnecessarily pollute the pond with rotting matter. A protective net also does away with the tiresome task of having to fish the fallen leaves out of the pond with a catch net. Cut back soft-stemmed plants now. Hardwood plants are best cut back in spring, as the stems assist in the exchange of gases in winter when the pond is covered in a sheet of ice. The filter and UV-C algae clarifier may operate as long as there is no danger of frosts in autumn and the beginning of winter, since they perform an important role in improving the quality of the water. Check, as in summer, that the devices are operating correctly. Since the pond filter and UV-C algae clarifier are not frost resistant, they should be removed, emptied and stored in a frost-free place before the first frosts. In winter the pond rests. The fish retreat to the deeper areas of the pond where the water is 40C. Their metabolism slows down to the minimum. Nevertheless the fish still require low amounts of energy to maintain their metabolism at this low level. JBL PondEnergil is the best method of providing the fish with just the right amount of energy in a form, which exactly meets their needs. When the pond is frozen over the fish can be carefully fed through the ice-free zone within the JBL Ice-Free or other equipment designed to prevent the pond becoming completely covered in ice. Before the pond begins to freeze over, appropriate equipment should be put in place to prevent the pond icing over completely and to allow the vital exchange of gases with the air to continue. The JBL Ice-Free or the JBL PondOxi pond aerating set prevent the pond freezing over entirely. A combination of ice-freeing equipment and a pond aerating set is recommended for regions with harsh winters. The aerating set ensures that there is movement of the water surface inside the ice-freeing equipment, preventing the thickening sheet of ice infiltrating the ice-freeing device. A covering of snow on the ice reduces the amount of light in the pond and prevents the assimilation of light, which is vital for the underwater plants. To prevent this, try to keep the ice as free of snow as possible.